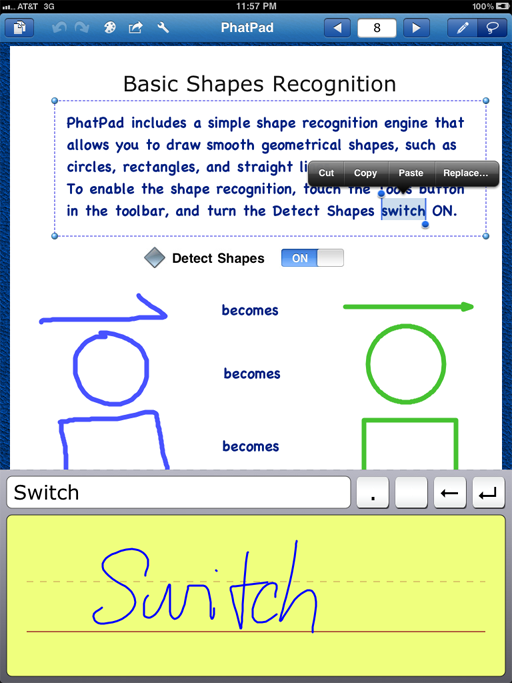 Developer Quote: "PhatPad offers everything you need to express your ideas, enabling you to draw pictures, jot notes, or put a mixture of drawings, images, handwritten and typed text on a virtual scratch pad." Your greatest ideas and brainstorms are sometimes only as excellent as you dreamed when you have a quick, handy place to jot them! Uncountable times I have considered an exciting workflow idea or plan to get the ball rolling in the office, but by the time I grab a working pen and paper, I've lost track of half that killer material! Gnashing my teeth in frustration won't help. I just need a better system of recording my thought processes efficiently and quickly. That's exactly why I turned to PhatPad! With this convenient note-taking tool, use a variety of input methods, including writing, typing or drawing to record your thoughts and plans effortlessly. This app is not bulked up with extraneous features or a cluttered work space, so no time is wasted in your document creation. What are some stand-out and clever features of PhatPad? What gives it an edge? For starters, how about shape recognition? When you need to draw certain objects, the powerful rendering engine cleans up your squirmy-looking shape into a perfect one (when the Detect Shapes feature is on)! 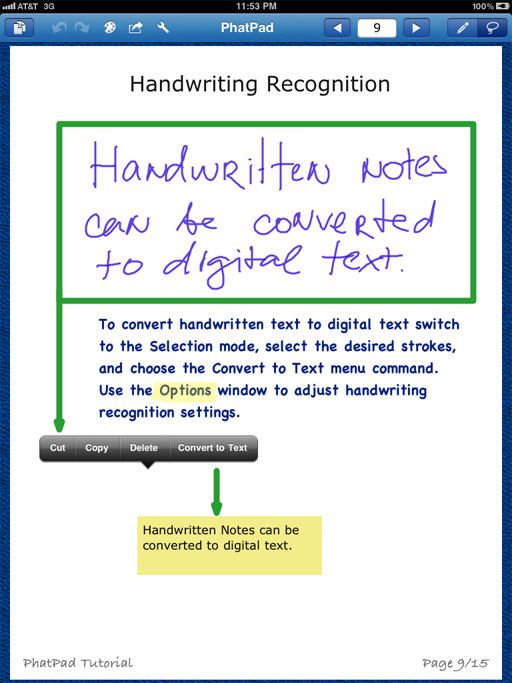 On that same line, you will find handwriting recognition in this app that lets you quickly scrawl your ideas, and convert them to neat text when you're ready to make a presentation. Incorporate all sorts of media into your notes such as audio, photos and drawings. Ready for some interesting news? You can select pictures from 3 methods: ClipArt Gallery (2,000 images), From Photo Album, or Take New Picture. The ClipArt Gallery really impressed me with high quality images from over 2 dozen categories such as Business, Communications, Computers, Education, Mobile, Medical, Jobs, Sports, and a ton more. 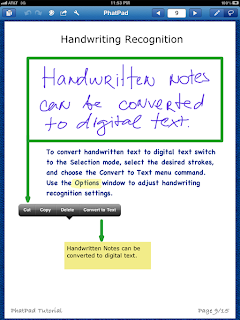 - Type or scribble notes using a smooth-flowing digital ink technology. - Combine drawing, handwritten text, images, and digital text on the same document page to create media-rich content. 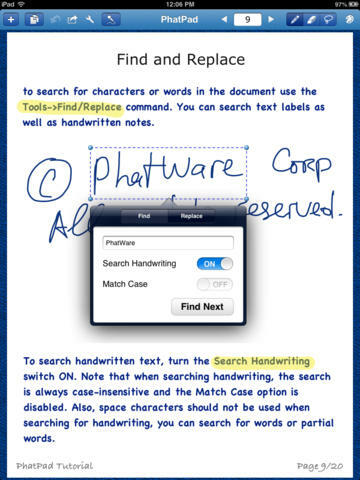 - Convert handwritten notes into text with PhatPad’s powerful handwriting recognition software. - Synchronize PhatPad documents with the desktop computer via iTunes, SkyDrive, and Dropbox. - Share documents between two or more devices on a local WiFi network, or email them to anyone from within PhatPad. - Send documents to a printer on your wireless network via AirPrint. 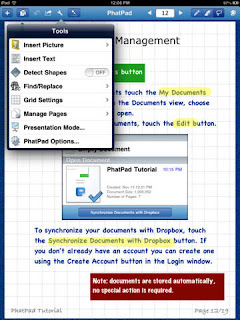 - Export PhatPad documents as a PDF. - Use standard editing commands such as Undo, Redo, Cut, Copy, and Paste. To begin your first PhatPad note, tap the "+" button. (After you have created and saved other notes, you will find them listed under the double page icon). Pick a writing/drawing pen or marker then select your preferred pen tip width as well as color, then get to work using your finger or stylus. Use the eraser as you work to get rid of unnecessary information. But let me point out, this eraser is a special eraser. Once you've tapped the eraser button, just swipe your finger through the unwanted material, and it's gone! 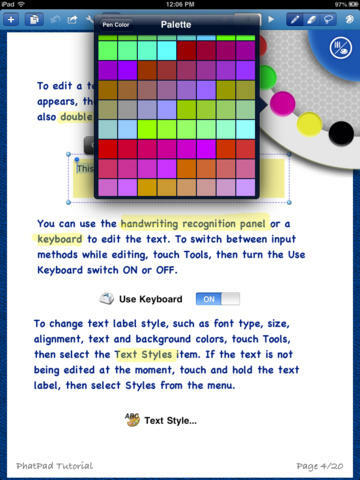 No more laboring over rubbing out each stroke on your page. Feel like incorporating audio? Just tap the mic and start recording and it's permanently recorded in that note page! Let's take a look at some handy Tools that are available under the wrench icon. They include: Insert Picture, Insert Text, Detect Shapes, Find/Replace, Grid Settings, Manage Pages, Presentation Mode and PhatPad Options. We discussed earlier in this post the Insert Picture options. Now on to Insert Text! This cool feature lets you write with your finger whatever you'd like, and then it transforms that into typed text. So very convenient if you have to present work to a boss who really does not want to see your messy handwriting. It's easy to erase one letter at a time using the left-pointing arrow. Now watch how your handwritten letters disappear while revising the typed script! Other Text options are: Text Format, Use Keyboard toggle, Lock Text toggle, Send to Back, Find/Replace, etc. 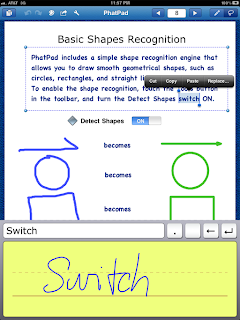 The Detect Shapes toggle neatens up your messy hand-drawn shapes. Find/Replace lets you search a needed file, Grid Settings provides choices of precisely laying out your work with vertical or horizontal spacing. Other highly useful options are: using Page Time Out in presentation mode (this allows you to set time duration for each page in your presentation), highlight chosen words by tapping and holding a marker till a window pops up with Opaqueness and Pen Width options (by altering the Opaqueness you can easily highlight in your preferred color), create folders in which to place varying levels of files, sort files by Name, Date, Size in Ascending or Descending order. Finally, with a document that's to your perfection, choose to Share in many ways: Print Document, Export to PDF, Export Page as Image, Send via Email, Send to Google Docs, Send to Evernote, Tweet This Page, Post on Facebook or simply Share via WiFi. I can't remember the last time I've had so much versatility and practicality at my fingertips in preparing files for business or pleasure! COOL CONCLUSION: Your stunning presentation for business or personal use is easily and professionally created with the versatile and comprehensive PhatPad!